Fall might bring in cooler temperatures, but it also brings in an increase in moisture. Cities across Canada all have to deal with this increase in moisture differently but every property relies on a perimeter drain to keep them going. Heavy rains might force owners or managers to call in a Vancouver gutter cleaning service, while prairie residents might need a Winnipeg eavestrough cleaning to combat snow melt. Whatever you call it, your drainage system needs help to keep going – and our Gorillas are it! Not clearing out gutter systems means that blockages are left to sit over long periods. Your system might be designed to carry water away from sensitive areas, but it can’t do its job if it is clogged up. With no way to drain, water from rain fall and snow melt is left to sit, rotting organic debris inside pipes. These covered spaces create a welcoming environment for both pests and property damage. 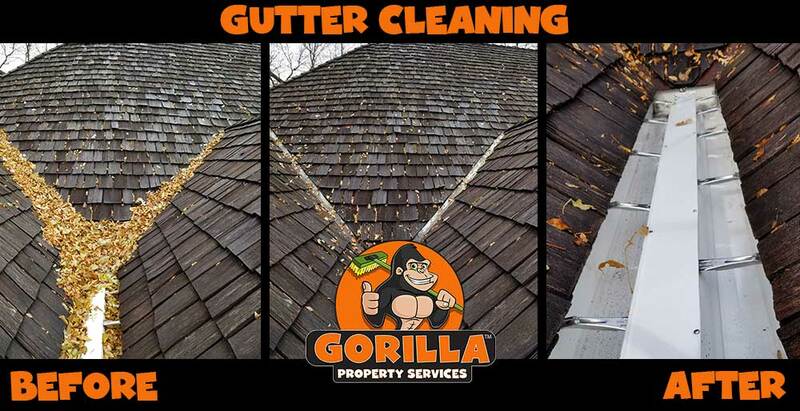 If you are noticing slow draining, or it has just been a while since your last cleaning, call a Gorilla to find out how the experts get the job done. Why Choose A Gorilla ? It seems simple enough to throw on a pair of gloves and run a hand through uncovered pipes but this doesn’t get results. Our Gorillas treat your space using high powered vacuums that can reach both uncovered and covered pipes, along with downspouts and other problem areas. This method insures that there are no hidden blockages within your system. Expert results are not enough to keep our Gorillas happy. Top safety practices and precautions take priority for our experienced staff. Gorillas only operate when they are fully insured in order to protect themselves and your residential, strata or commercial property.